The robot consists of an Ensenso N35 3D camera from IDS and two robot arms equipped with grippers to pick up objects. The robot hardware is designed to simulate how people mount objects: the "eyes" are replaced by a 3D camera and the "arms" by industrial robot arms capable of moving in six axes. Each arm is equipped with parallel grippers for picking up objects. Force sensors are attached to the wrists to determine how strongly the "fingers" grip and how strongly they bring objects into contact with each other. The robot starts the assembly process by taking 3D images of the parts lying on the ground to create a map of the estimated positions of the various components. This task is performed by an Ensenso 3D camera from IDS. The camera works according to the "projected texture stereo vision" principle (Stereo Vision), which imitates human vision. Two cameras acquire images from the same scene from two different positions. Although the cameras see the same scene content, there are different object positions according to the cameras’ projection rays. Special matching algorithms compare the two images, search for corresponding points and visualize all point displacements in a Disparity Map. The Ensenso software can determine the 3D coordination for each individual image pixel or object point, in this case the chair components. "For a robot, putting together an IKEA chair with such precision is more complex than it looks," explains Professor Pham Quang Cuong of NTU. "The job of assembly, which may come naturally to humans, has to be broken down into different steps, such as identifying where the different chair parts are, the force required to grip the parts, and making sure the robotic arms move without colliding into each other. Through considerable engineering effort, we developed algorithms that will enable the robot to take the necessary steps to assemble the chair on its own." 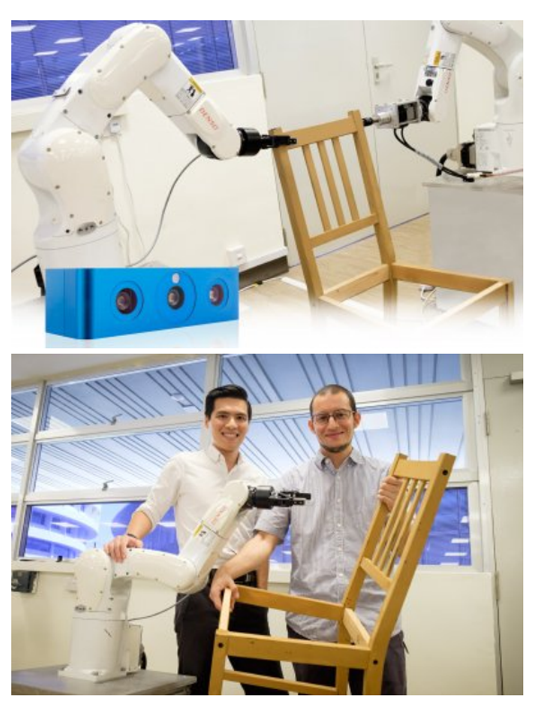 The result: the NTU robot installs the "Stefan" chair from Ikea in just 8 minutes and 55 seconds. According to Professor Pham Quang Cuong, artificial intelligence will make the application even more independent and promising in the future: "We are looking to integrate more artificial intelligence into this approach to make the robot more autonomous so it can learn the different steps of assembling a chair through human demonstration or by reading the instruction manual, or even from an image of the assembled product." IDS is a leading manufacturer of industrial cameras "Made in Germany" with USB or GigE interfaces. Equipped with state of the art CMOS sensors, the extensive camera portfolio ranges from low-cost project cameras, to small, powerful models with PoE functionality or robust cameras with housings that fulfill the prerequisites for protection code IP65/67. For quick, easy and precise 3D machine vision tasks IDS offers the Ensenso series. With the novel vision app-based sensors and cameras of IDS NXT the company opens up a new dimension in image processing. Whether in an industrial or non-industrial setting: IDS cameras and sensors assist companies worldwide in optimizing processes, ensuring quality, driving research, conserving raw materials, and serving people. They provide reliability, efficiency and flexibility for your application. Embedded vision solution with USB 3.0 board-level camera. Using 3D data for the autonomous robot. More about IDS Imaging Development Systems Inc.